Is there anything better than warm apple cider doughnuts fresh from the farm? It’s one of my favorite treats this time of year! It’s mandatory for me to finish a day of apple picking with some fresh cider doughnuts. But what if you’re not a “pick your own” person? Or maybe a farm isn’t exactly local for you. Not to worry - you can still make this quintessential Fall favorite in your own home! And like all things homemade - it’s always better that way! I came up with this recipe while working in news because the job left little time for anything else besides catching up on much needed sleep! So I wasn’t able to enjoy my usual traditions. But I wasn’t willing to give up my annual cider doughnuts! Plus, when you make your own, you can control the flavor (hello extra cinnamon!) AND you can adjust the recipe to fit some different dietary needs! 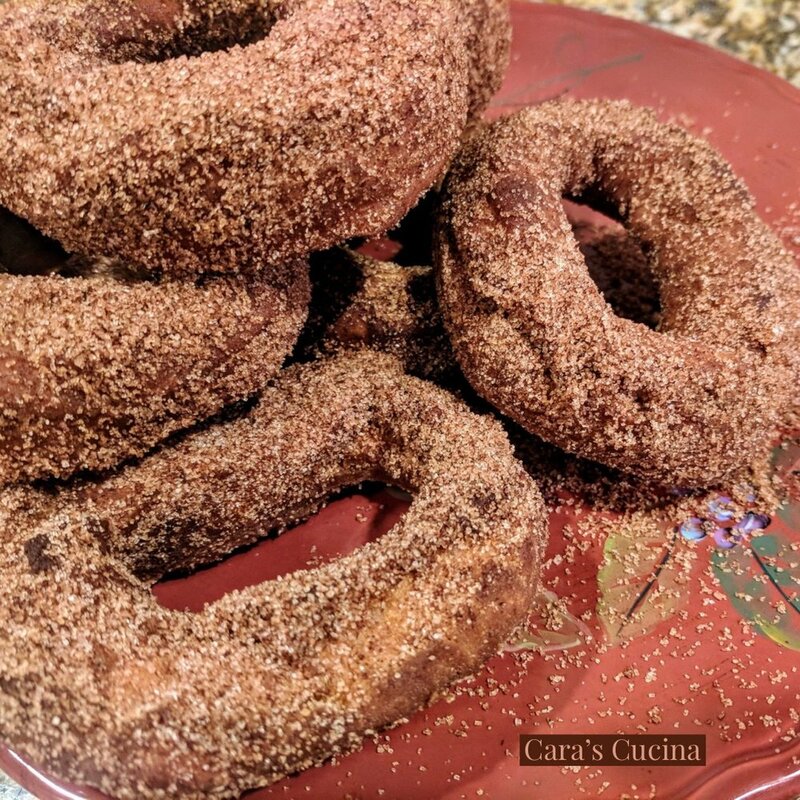 Swap in your favorite gluten-free flour (I suggest a standard 1 to 1 mix) or use a vegan butter - cooking for yourself is ALWAYS going to be better for you - even when you’re making doughnuts! The other thing I love about this recipe is that you use all the dough so there’s no waste. It’s the fun part of doughnuts. Whoever invented that whole doughnut hole thing is a genius - why throw that out!? It’s perfectly edible! I hope you enjoy this recipe and share the results with family and friends! Because that’s always the real reason we cook - to share. For cinnamon sugar coating, combine 1 C. sugar with 2 Tbs. cinnamon in a brown paper bag - set aside. Boil cider in a small sauce pan until it is reduced by at least half - about 20 minutes. Set aside to cool. Using a stand or hand mixer, cream the butter and sugar together. Combine flour, baking powder, baking soda, cinnamon, nutmeg and salt in a large bowl. Combine cooled cider, egg, applesauce and buttermilk in a separate small bowl. Pour half of the milk mixture into the sugar and mix, followed by half the flour. Repeat additions, mixing after each one. Turn dough out onto a floured surface ( it may be very sticky, don't be afraid to add some more flour) and knead a few times, then pat down until about 1/2 inch thick. Using a donut cutter, cookie cutters or a drinking glass and shot glass, cut donuts from dough, and then holes from each donut. Set each cut piece aside on another floured surface. Heat about 1 inch of canola oil in deep, heavy fry pan until very hot. Gently place donuts into oil, 2-3 at a time and allow to cook for about 2 minutes per side. Be VERY careful when flipping donuts - they can slip a little and will cause hot oil to splash. Remove cooked donuts from pan and place directly into bag with cinnamon sugar topping - shake bag well until donuts are completely coated. Set to drain on a cookie sheet lined with paper towels. Serve warm or store in an airtight container at room temperature.